Games Khmer Play on Khmer New Year Day? Cambodia is home to a variety of games played to transform the dullest days into a memorable occasion. Through-out the Khmer New Year, street corners often are crowded with friends and families enjoying a break from routine, filling their free time dancing and play. 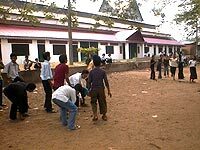 Typically Khmer games help maintain one's mental and physical dexterity. The body's blood pressure, muscle system and brain all are challenged and strengthened in the name of fun. Why not try them for yourself? A game played by throwing and catching a ball with one hand while trying to catch an increasing number of sticks with the other hand. Usually, pens or chopsticks are used as the sticks to be caught. 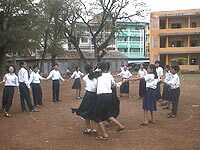 A game played especially on the first nightfall of the Khmer New Year by two groups of boys and girls. Ten or 20 people comprise each group, standing in two rows opposite each other. One group throws the "chhoung" to the other group. When it is caught, it will be rapidly thrown back to the first group. If someone is hit by the "chhoung," the whole group must dance to get the "chhoung" back while the other group sings. A game played by imitating a hen as she protects her chicks from a crow. Adults typically play this game on the night of the first New Year's day. Participants usually appoint a person with a strong build to play the hen leading many chicks. Another person is picked to be the crow. While both sides sing a song of bargaining, the crow tries to catch as many chicks as possible as they hide behind the hen. A game played by two groups of boys and girls. Each group throws their own "angkunh" to hit the master "angkunhs," which belong to the other group and are placed on the ground. The winners must knock the knee of the losers with the "angkunh." "Angkunh" is the name of an inedible fruit seed, which looks like the knee bone. A game played by a group of children sitting in circle. Someone holding a "kanseng" (Cambodian towel) twisted into a round shape walks around the circle while singing a song. The person walking secretly tries to place the "kanseng" behind one of the children. If that chosen child realizes what is happening, he or she must pick up the "kanseng" and beat the person sitting next to him or her. A game played by two children in rural or urban areas during their free time. Ten holes are dug in the shape of an oval into a board in the ground. The game is played with 42 small beads, stones or fruit seeds. Before starting the game, five beads are put into each of the two holes located at the tip of the board. Four beads are placed in each of the remaining eight holes. The first player takes all the beads from any hole and drops them one by one in the other holes. He or she must repeat this process until they have dropped the last bead into a hole lying beside an empty one. Then they must take all the beads in the hole that follows the empty one. At this point, the second player begins to play. The game ends when all the holes are empty. The player with the greatest number of beads wins the game.